Yes, I am enjoying the "new to me" stamp set, but I am quickly running out of pumpkin pie buttons. I did squeeze in fourth card for an upcoming wedding. Sweet card! 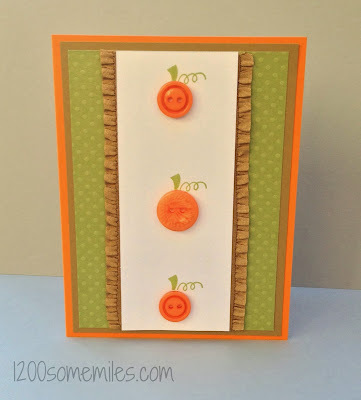 I love the button pumpkins and the Baked Brown Sugar Ruffled Ribbon trim. Thanks for joining us at the Pals Paper Arts! This card is so adorable. Perfect combination of papers and embellishments. Love the ruffled ribbon, too! Thanks for sharing with us at Pals Paper Arts this week!